Lucy, Lucy, Lucy the Explorer! You guys. My princess is turning 3 in NINE DAYS. I KNOW. Seriously. How did we get to THREE already? Wasn’t it just yesterday that she was born?? Lucy’s been really into Dora and Diego, so she adamantly said she wanted a Dora party. Joe has made her invites for the last two years, but this year we’ve all been so busy that I found her invites on Etsy and FELL IN LOVE. I mean, how super cute are these?? Since we’re having the party at a bouncy place, there’s not much for us to do. We’ll probably take some simple decorations, but we’re not really going overboard. This year, I want to just take it easy and enjoy the party, which I was trying to do (despite the fact that I am completely Type A and am relying on the party pros to make Lucy’s day awesome). I kid you not. That is what she said. SEVEN DAYS out from the party. And, of course, I found this out as I was walking in to get a mani/pedi, so spending an hour or so relaxing was kind of hard to do. The cake is a really important part of the party to me, so this was just devastating. But, we did what we always do, and we found another person to make her cake, who happens to be Lucy’s babysitter’s daughter. She makes cute cakes, and she said it was no problem to make the cake we’re looking at. Want to see the cake I got my inspiration from? Of course, you do! Instead of the cardboard characters, though, we’ll have toys that I found on eBay. 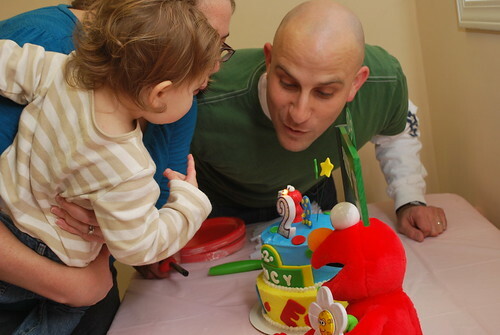 And, since Lucy’s party is on my Dad’s birthday, we’re going to have a cake for him, too. Can you guess the theme? DIEGO! It’s going to be super cute, and Lucy is really excited. I love planning Lucy’s birthday parties, and even though we won’t be doing as much decoration-wise as we have in the past, I’m still excited because her party is going to be awesome. It’s everything she loves and is going to make her ridiculously happy. And, that, is what’s most important. We decided a while ago that we wanted to get Lucy involved in some sort of activity. Friends and acquaintances had suggested ballet, maybe because Lucy is a girl, but anyone who knows my daughter knows that she is NOT the ballet type. She is more into running, jumping and tumbling, which is why we decided gymnastics would be a good fit for her. And, boy, did we make the right decision! 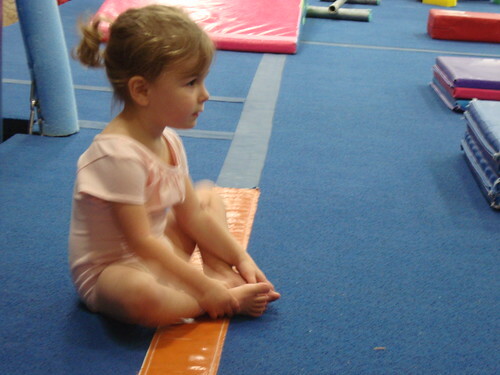 Gymnastics class is the highlight of her week, and she cries when the 30 minutes are up. We took her to the first class dressed in shorts and a t-shirt, and then realized that they want the girls to wear leotards. So, we went right out and bought her one. She looks so incredibly grown up in it to me. Class always starts with a warm-up activity (last week is was bouncing across the warm-up area on balls) and stretching. Lucy is getting really good at getting all the stretches right, and her flexibility amazes me. She can touch her nose to the ground. I hope she always has good flexibility. Then, we normally do something like handstands against the wall — and last week we did some wall climbing — before we do the circuit. 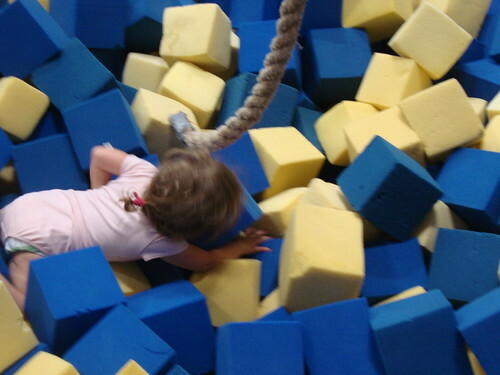 Last week’s circuit consisted of a somersault from a standing position, jumping onto a block and then off, going under an arch, and then jumping on this octagon-shaped rolling thing and doing a roll off it. The kids normally do each activity three times. The teacher changes up everything each week, which I like because they don’t get bored doing the same thing (although, Lucy would be completely happy doing the monkey bars all the time, which is what they did two weeks ago). 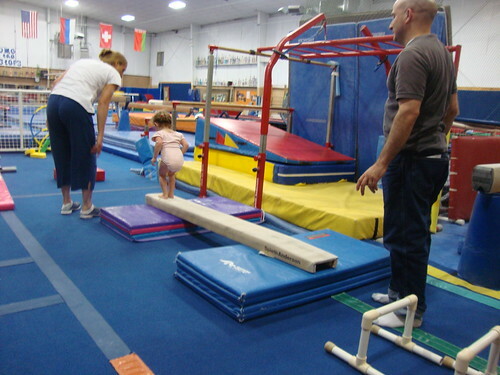 They also usually get in some balance beam work, and class always ends with a jump into the foam block pit (which terrifies Lucy). We’re so glad we signed her up for this summer class, and I think we’re going to sign her up for the longer class once the school year starts. I have a feeling this is not going to be a fleeting interest for Lucy, which I’m so glad about. I’m going to have to go buy a “Gymnastics Mom” magnet for my car now! Lucy had her 2-year checkup this week. She is still a t-i-n-y girl. Tiny and tall. She weighed 23.6 pounds and was 34 inches tall. Her doctor said that you can determine a person’s height by doubling their height at age 2, and that puts Lucy at a predicted height of 68 inches, or 5’8″. I find that hard to believe because neither Joe nor I are tall, but there are some tall people on my side of the family, so I guess we’ll see. Before we were called back, I had to fill out a questionnaire, which I later was told was an autism screening. One of the questions asked if I thought my child might be deaf. That’s not really a fair question since what child listens?? Lucy’s appointment went well besides, you know, the 2-year-old tantrums. Luckily, the nurse said that it’s normal behavior for these appointments. That didn’t help me feel much better, but it is what it is. I am just thankful we don’t go back until her 3-year-old checkup. 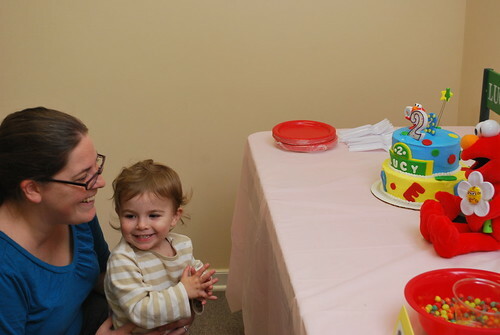 Today you turned 2 and, as excited as I’ve been for your birthday (or, should I say, your birthday party), it also makes me kind of sad to see you turn another year older. You’re no longer a baby. You’re a toddler. You’re my little girl. You definitely have your attitude, which you have developed since your first birthday, but for the most part, we find it cute. You’ve recently started giving us your little “Whatcha talkin’ about?” look. You come close to rolling your eyes, but you’re not quite there yet. It’s ridiculously adorable. You are talking up a storm. A good bit of it is still jibberish, but you are saying more and more words. When you wake up in the morning, you ask for whichever parent doesn’t get you up, and then, on the way to the kitchen to get your morning bup (cup), you say hi to all the cats. “Hi, Dizzy! Hi, Ah (AJ)! Hi, Dada (Callie).” You also have to say hi to your Care Bears — “Ah duh” (the purple bear) and “Meen” (the green bear). You take your two Care Bears, your Tigger and your Tigger pillow EVERYWHERE you go. We call them your entourage. Eating is still a struggle at times. Sometimes you’ll pig out, and other times you’ll hardly eat anything. You can, however, eat your weight in carrots. It’s your favorite food, which cracks me up because what kid likes vegetables?? Bath time is still your favorite thing. The other night, you were in the tub for about 40 minutes. You would sit in there all day and play with your toys if we let you. Another favorite of yours? 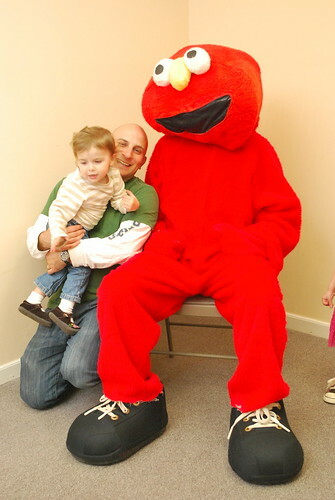 ELMO! 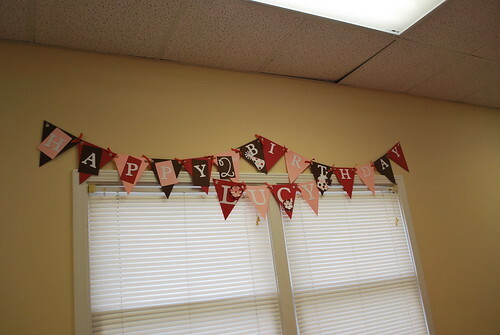 So, it was fitting that we used that as the theme for your birthday party. 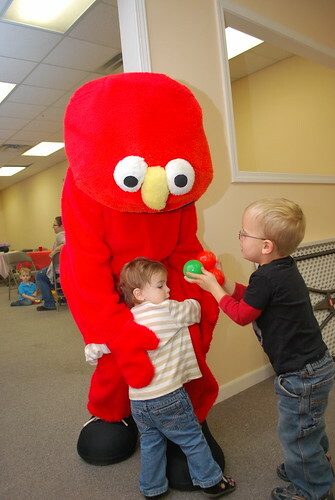 And, Elmo even made a guest appearance! You were in awe, and you were so sad when he left. Mommy’s eyes teared up a little watching you run up to him and give him a big hug. I love making you so happy. Although every new stage is more fun than the last, I do wish time would stop just for a bit so I can enjoy them just a little bit longer. Time is just flying by way too quickly. I love you so much my little sugar monkey! 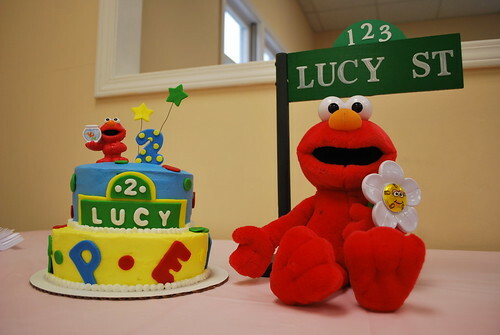 It’s September, and that means it’s time to starting planning Lucy’s 2nd birthday party. Of course, if you know me, you’d know I’ve already been “planning” but coming up with ideas of things I want to do, but now it’s really time to buckle down. Our first hurdle is to pick a location. I’m having a hard time deciding where exactly to have it. There are two play places that Lucy loves that I’m considering. The other option is doing the same kind of thing we did last year where we use a room (last year, we used the fellowship hall at my old church), decorate, bring some toys for the kids and just let them all play. 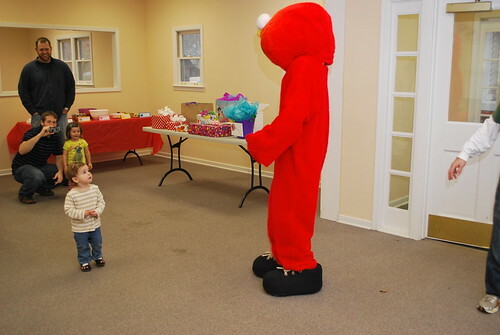 The theme this year is Elmo. Well, Elmo and Abby. 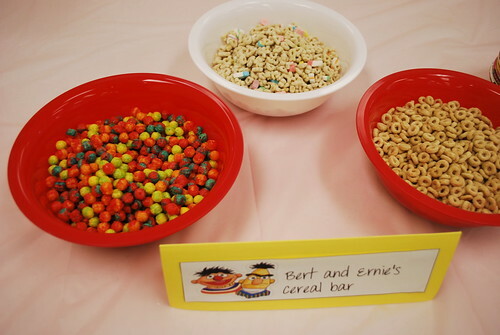 And, maybe Ernie. Because Lucy is obsessed with them. I’m super excited because I’ve found some neat decorations. 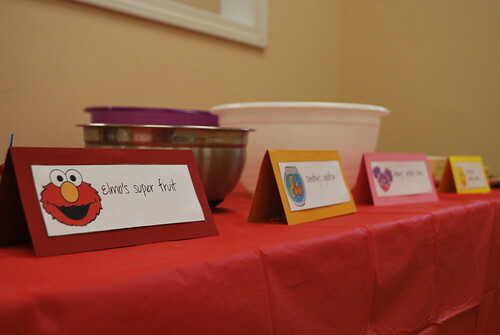 And, we have some fabulous ideas for her birthday invitations. I’m super excited. I LOVE designing her invites every year because they’re personalized and special. Maybe now is a good time to start getting into Pinterest. Maybe I can find some great ideas on there to help me with this year’s bash.